Found something yellow in your bag? See if it matches any of the images or descriptions below! Although its peel is thicker and bumpier than other summer squash, the inside is delicate and mild in flavor. Sautee with butter and herbs or add to stir fries. 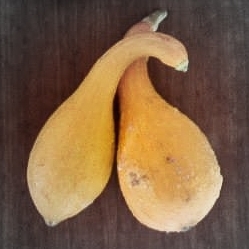 A winter squash with mild yellow flesh. Halved, lightly oiled, and roasted cut-side down, these squash are delicious. For a mild garlicky flavor, try slipping a clove of garlic under each half before they go into the oven. They are also quite good for stuffing and baking. 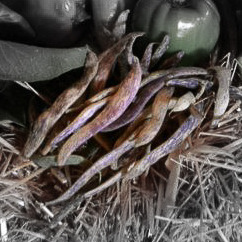 These yellow and purple wax beans are a Dutch heirloom variety. Sadly, their purple coloring fades when they are cooked. Prepared simply, these beans have a wonderful, crisp texture and fresh, juicy flavor. 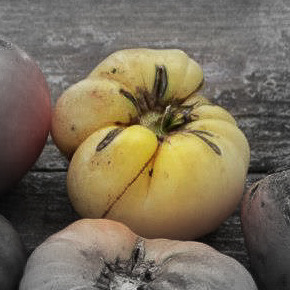 A delicate yellow tomato with a soft pink blush and fuzzy skin. This fruity and mild tomato is best served raw, atop salads or on its own. This large tomato is light yellow to creamy white in color. It's a meaty tomato with few seeds and low acid. A great slicing tomato! One of our late melon varieties Ha'Ogen a heirloom from Seed Savers Exchange. These are delicate green fleshed sweet melons. A very hot, bright yellow little pepper, the Ho Chi Mihn pepper works well in soups and curries. If you're sensitive to heat, go easy. This pepper will be milder at the tip and spicier nearest the seeds. 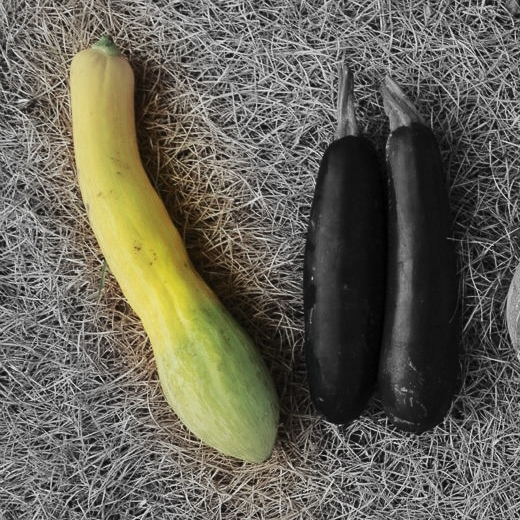 Patty Pans are cute little summer squash with delicate flesh. They can be sliced and sauteed like other varieties of summer squash, or stuffed with vegetables, bread cubes, cheese, or herbs and baked until tender. Named for its stringy flesh, spaghetti squash makes a great gluten-free alternative to semolina pasta in your favorite Italian dishes. Halved and lightly oiled, spaghetti squash can be baked and served with a dusting of herbs and Parmesan cheese for a simple, delicious side. Gold beets are a brilliant yellow-orange color inside and out. They're milder in flavor than red beets, but just as packed with nutrients. Golden beets are great shredded in this raw beet salad or roasted with olive oil and salt until tender. We grow a couple varieties of yellow onion, including Prince Onion and New York Early. 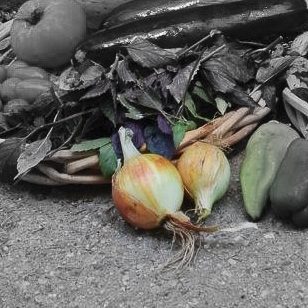 These varieties are good storage onions and, if kept properly, can last into early spring. Another variety of summer squash, the zephyr squash can be eaten like any summer or zucchini squash. For a lighter summer meal, try this grilled squash lasagna.